Mizzima News | According to the Myanmar Police Force, two Cameroon nationals staying at Chan Myae guest house in Maha Bandoola Street, Kyauktada Township, Yangon were arrested with counterfeit US currency and equipment used in counterfeiting currencies in their possession. On March 21, a joint team of police personnel from Bahan Myoma Police Station, Yangon Region, Criminal Investigation Department (CID), Western District Police Officer office, Special Branch (SB) of Police and Tourist Security Police investigated a news tip-off they received about possession of counterfeit foreign exchange. 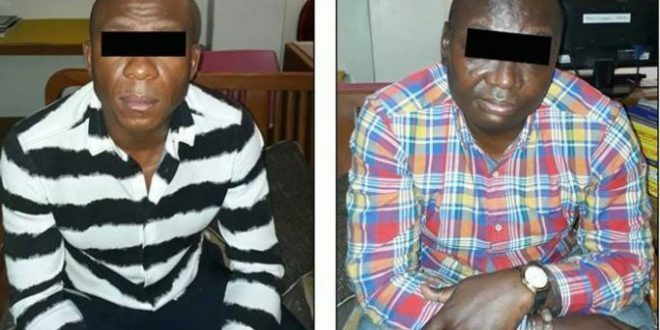 They found two Cameroon nationals, Mr. Guillaume Nekndo Tchoungang (33) and Mr. Charles Abe Etounit (46), who were then interrogated. The joint team found 3,471 notes of US currency believed to be counterfeit from Room No. 716 where Mr. Tchoungang was staying and equipment and accessories totaling 20 numbers used in making counterfeit notes from Room No. 715 where Mr. Etounit was staying. The police charged the men under sections 489 (a), (b), (c), and (d) of the Penal Code. The easy way is not always the best way, whether in Cameroon, Myanmar or Eyjaffjallajokull! This is true for trade in fake currency, human beings, fake diplomas, fake election results, etc. They hardly bring the much coveted peace or happiness. There is no counterfeit money. They just can’t manufacture money. They just use some powerful techniques to trick you into believing that they can multiply banknotes. Meanwhile, the money earned from these activities don’t last long, as it is outspent on hotels and prostitutes. Action is what separates a belief from an opinion. Beliefs are imprinted through actions.